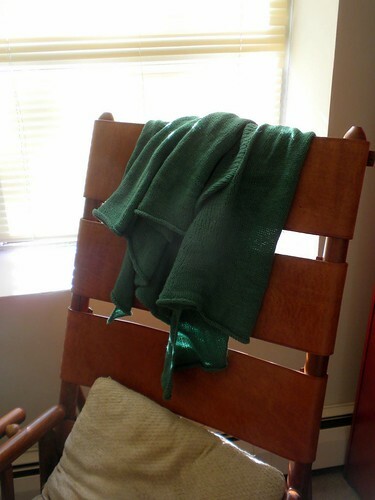 Pattern: Peggy Sue by Linda Wilgus, a free pattern from Knit on the Net. My project page is here. Yarn: Knit Picks CotLin 8-ply DK weight, 70% cotton / 30% linen, in Sprout; I used less than 5 balls, approximately 250 grams, which was 615 yards / 562 meters. Modifications: Omitted waist cables, knit button band in garter stitch, continuously with body. 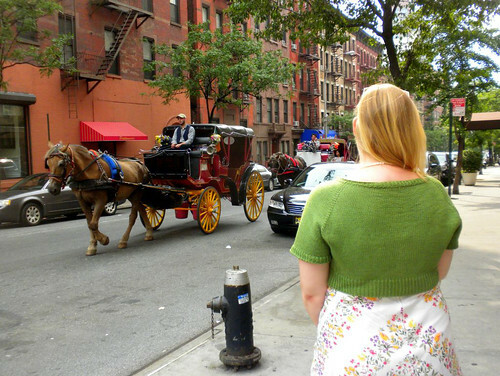 * – Actually, I finished knitting it July 19, 2010, then I took until August 15, 2010 to block it. 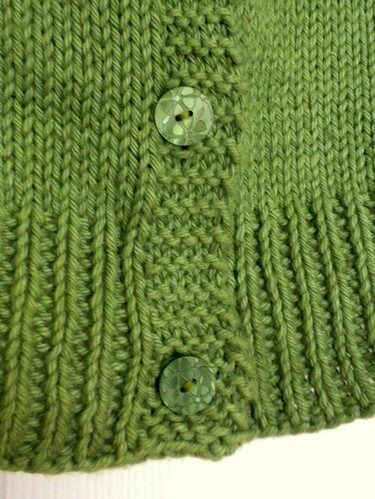 Then I thought about buttons for a year and finally sewed them on August 15, 2011. Then I waited another 9 months to actually wear it out and photograph it. 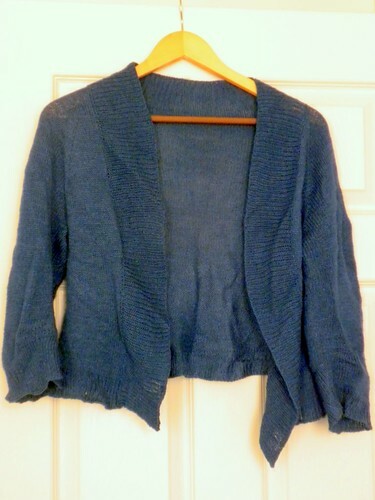 In an unprecedented streak of FOs, I have another little cropped cardigan. 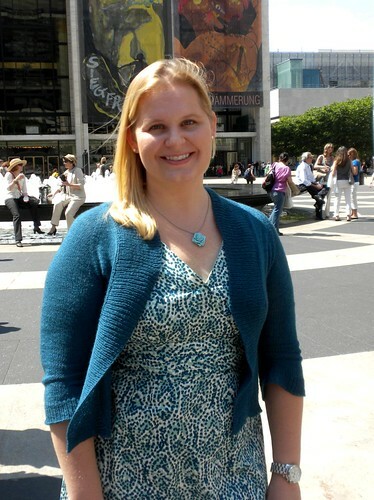 I realized recently that if I wear my hand-knit garments when I meet my mother for the ballet, I can ask her nicely to photograph me with a scenic Upper West Side backdrop, at a time when my hair is brushed and I am (more or less) put together. These results obviously vary, and while my mother is a very talented photographer on her own, I don’t think she particularly excels at snapping flattering shots of me. But to be fair, I’m probably not going to like any photographs of myself until I am at a healthier weight, so I’m going to shut up and be content that she obliged me in taking any photographs at all. And get to talking about the knitting. 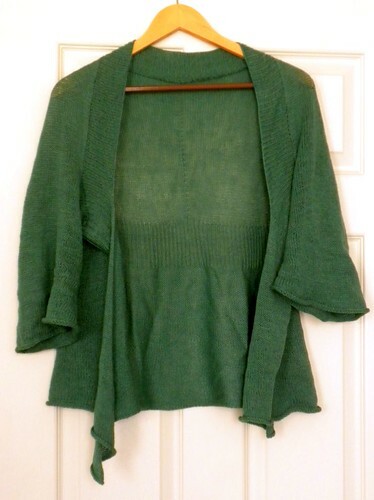 I like this style of cropped cardigan very much because it gives modesty to low-cut spring or summer dresses, without adding bulk or a bunch of fabric around one’s waist and back. I’ve noticed that a lot of “summer cover-ups” that can be found in stores tend to hang past the hips and obliterate any sense of the silhouette. I think they try to make up for the one-size-fits-all lack of shaping with open weave crochet and a sort of beachy vibe, but to me, that tends to accentuate the frumpiness. I realize this is totally a personal bias, but for me, I want something that seems a bit more tailored, while still having the ease and softness of a sweater. This project involved a lot of pausing and deliberating, which could rightfully be interpreted as dragging my feet. I loved the original design straight off. At the time though, I had an intense cable aversion, after working too many teeny tiny cables on socks, so I decided to omit them and put ribbing in their place. 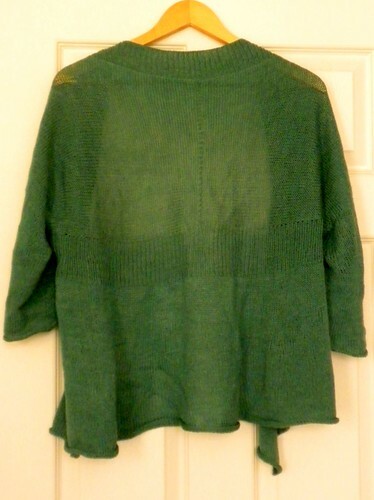 Predictably, the design sort of depended on the cables pulling the sweater in at the waist, which mine does not do. I further modified the shape by continuing in stockinette longer than I should before switching to ribbing because I didn’t want the switch to hit at a weird spot on my bust-line (I’m sure everyone has that one top with the seam that insists on riding up and making it look like your breasts are falling out the bottom). These modifications probably would have been alright if I had added in a little waist shaping or continued the ribbing longer, but I was limited by both the amount of yarn I had to use and by the total lack of elasticity in this cotton/linen blend. I genuinely love the yarn, and I was impressed by how comfortable it was to wear and the nice drape it had – but it is not a clinger in any way. It gives the sweater a sort of popover feel, without veering too far into boxiness, so it still feels nicely retro and feminine. It’s also entirely possible, based on the wideness of the neckline, that I’ve knit too large a size or that my gauge was completely off. I honestly never checked because I liked the fabric I was getting. Ah well. One of my biggest concerns was that the button bands not gap at all, even in the slightest. This fixation may be part of why I was okay with a roomier size. I took a page from a seamless baby cardigan that I had knit, working the button bands at the same time as the body of the sweater. I chose to work them in garter stitch, instead of moss stitch called for in the pattern, because I reckoned that would match better with the ribbing I was planning. I also off-set the buttonhole by one stitch, so that there was slightly more fabric on the outer edge of the band, and I sewed the buttons a little bit off-center as well. I’m glad I paid attention to the buttons. They can make or break such a simple garment. I’m trying to be mindful of this type of finishing detail, much as I loathe sewing on buttons, because in the end, I’m really happy with these. They’re a shiny plastic that is a nearly perfect color match for the yarn, with pretty abstracted flower shapes that pick up the springtime, garden idea. I was careful to sew them all exactly horizontally (despite their appearance in this photo) so the front band would have a uniform feel. Considering I will most likely exclusively wear this sweater buttoned, I’m very pleased that the bands don’t gap at all and the whole thing looks tidy. I think if I had it to do again, I’d knit this sweater in a stretchier yarn, or I’d go another direction with a fluffy mohair or angora. 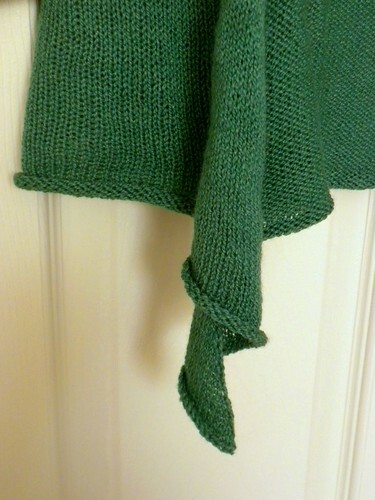 I would also get over my aversion and knit the cables because I think they would have impacted the shape significantly. Still, this is a cute and wearable top. Its seamless construction made it both highly enjoyable to knit and incredibly comfortable to wear. Now I just have to get the Buddy Holly song out of my head. 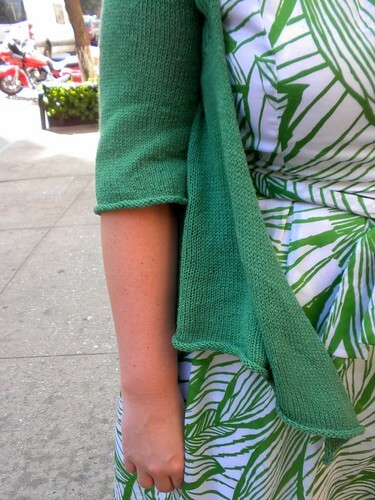 Pattern: Whisper Cardigan by Hannah Fetig, from the Spring 2009 Interweave Knits. My project page is here. Yarn: Knit Picks Gloss Lace 2-ply laceweight, 70% wool / 30% silk, in Malachite; I used about 2.44 skeins, approximately 122 grams, which was 1074 yards/ 981 meters. Modifications: Lengthened sleeves and back. No surprise, I adore this sweater. Projects like this sweater are the reason I wanted to learn how to knit. I was able to turn some thin wool/silk string into a garment that is my favorite color, customized to my size, in a beautifully-designed style, the likes of which I could never find in a store. And I had fun doing it! Unfortunately for Bette and I, no, they really aren’t. I snarkily replied to her Tweet (which also called on Tim Gunn) by pointing out that the last winner of Project Runway, Anya Ayoung-Chee didn’t even know how to make sleeves. But really, am I just shopping in the wrong stores, or is there a serious deficit in spring/summer dresses (or even fall and winter dresses) with sleeves that adequately cover the arms? At best, maybe you can find a fluttery cap sleeve, but that doesn’t really cut it. I am nuts about sleeves both for modesty (I just don’t think underarms are appropriate in professional or non-beach settings) and because my arms always get cold in air conditioning and at night. I also really don’t like how fat and flabby my upper arms are right now, so for nicer occasions (or really any occasion) I don’t want to put all that on display. I love this sweater because it gracefully covers my arms without completely obscuring my dress. It keeps me comfortable in air conditioning, but because it is so lightweight and breathable, I was equally comfortable in 78-degree sunshine. 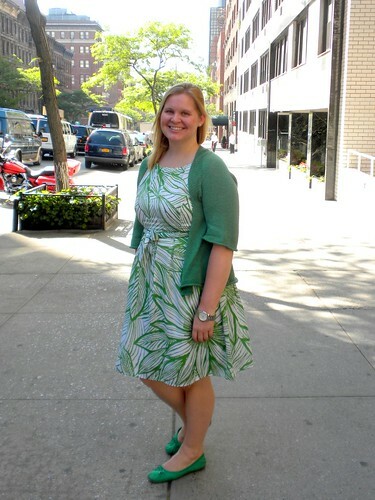 Fluttering around weightlessly, it added a draped, feminine touch to complement my dress without making me look buttoned-up and constricted, too prim, or too childish, as shrugs and cropped cardigans sometimes can. 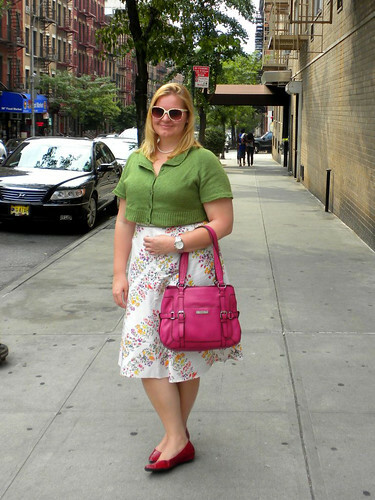 I think it will also work well over tank tops and sleeveless blouses for a more casual look. In short, as a garment, this one is perfect. And at 120 grams, it weighs next to nothing, so it makes a great carry-along in case I ever do want to bare my arms, without adding bulk or weight to my bag. Because this is my second time knitting this pattern, I already knew the changes I wanted to make. I lengthened the sleeves by 10 rows at the end of decreasing so they would come down past my elbows. I lengthened the back and “skirt” portion to 11″ below the ribbing, so that it would hit in a place I liked, especially when I sat down. I found the parts of the sweater that curved forward (formed by increases at the edges) perfectly covered my midsection while seated (it’s wrinkled in the back in the first photo after I spent the afternoon at the ballet, but it was sorted by the time I got home). I already knew how much I love this yarn. In this color, the little twirly edges remind me of tendrils, which makes me love it even more. 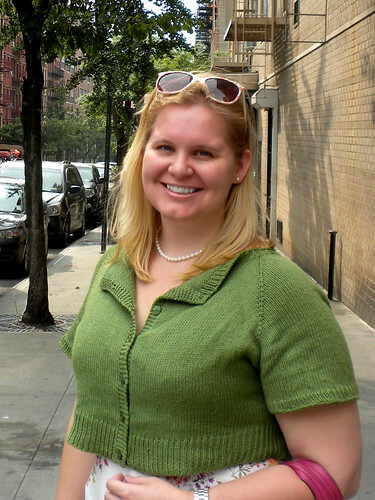 The slightest issue I had while wearing it – which was probably caused more by the neckline of my dress – is that occasionally it would fall open more on my right shoulder than I wanted it to (I had my purse on my left shoulder). I tried it on over a tank top when I got home, and it was fine. I’m incredibly pleased with this sweater and this project. I was delighted to see that working exclusively on one project – even in laceweight yarn – produced pleasantly speedy results. The turnaround time was faster than the 3 weeks indicated because I started one sleeve before finals, then finished the entire sweater the week after. As I noted in an earlier entry, if I can speed up my ribbing, it would have taken half the time. So Bette Midler and I can quit despairing about dresses not designed with women like us in mind. We may not get sleeves on the dress, but I can totally whip up something fabulous that I love to wear. You can bet there will be even more laceweight, seamless sweaters in my future. Yarn: Knit Picks Gloss Lace 2-ply laceweight, 70% wool / 30% silk, in Aegean; I used about 2.38 skeins, approximately 119 grams, which was 1074 yards/ 957 meters. Oh boy, what a saga this sweater has been. Though it was literally years in the making, it was worth it. I’m thrilled with it, and it’s everything I thought it would be. It’s perfectly lightweight, but substantial enough to keep me warm in the enthusiastic air conditioning of NYC (this time was at the NYC Ballet, where I usually freeze). It’s crisp and trim enough to look professional, with an airy drape and fluttery quality that make it really enjoyable to wear. The only real modifications I made were in working kf&b increases, offset by one stitch from the raglan “seam” and working 1×1 ribbing for the collar and band edging so it wouldn’t roll. 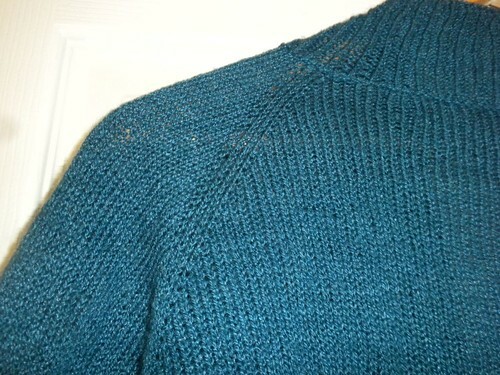 The ribbing was suggested in the pattern, and I like the way it relates to the 1×1 ribbing at the lower edge. I’ve probably professed my unending love for seamless sweaters before, but I seriously can’t say enough good things about how tremendously satisfying it is to make a laceweight sweater that is basically flawless. This pattern is brilliant, simple, and fun. It has gotten me positively addicted to laceweight, seamless sweaters (expect more soon), and I’m thrilled with the results. I’m equally thrilled with the yarn and its genuinely lovely color. I just plain love this sweater.